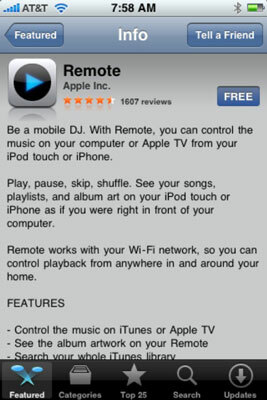 You can download an app directly to your iPhone from the iTunes App Store. 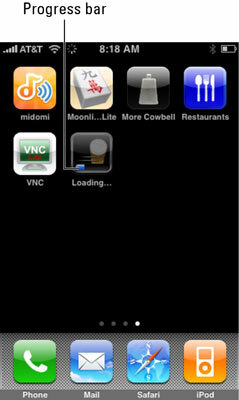 Once you have located an app that you want, you simply tap the app to display its detail screen. You then tap the price button near the top of its detail screen. Click the blue price button next to the app to download it. You may or may not be asked to type your iTunes Store account password before the App Store disappears and you’re taken to the Home screen page where the new app’s icon resides. The new icon appears, slightly dimmed, with the word Loading beneath it and a blue progress indicator near its bottom. The blue progress bar indicates that this download is about one-third done. If the app is rated 17+, you see a warning screen after you type your password. You have to click the OK button to confirm that you’re over 17 before the app downloads. Remember that the app is now on your iPhone, but it won’t be copied to your iTunes library on your Mac or PC until your next sync. If your iPhone suddenly loses its memory (unlikely), or if you delete the app from your iPhone before you sync, that app is gone forever. After you download an app to your iPhone, the next time you sync your phone you’ll see a dialog box that informs you: “iTunes has found purchased items on the iPhone that are not present in your iTunes library. Do you want to transfer these items from this iPhone back to your iTunes library? If you do not transfer these purchased items to your iTunes library they will be removed from your iPhone.” Your options are Transfer or Don’t Transfer. Click one. By the way, although the dialog box refers to “purchased items,” you’ll see it even if the app was a freebie.